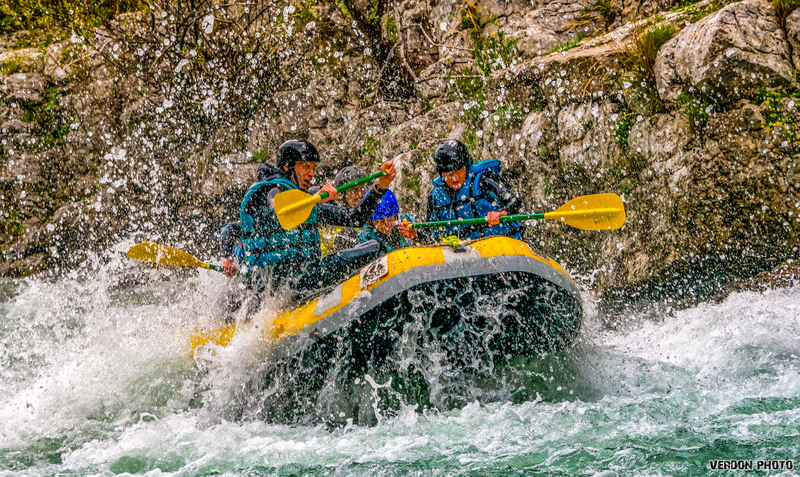 Rafting is a white-water sport which involves navigating on the river aboard an inflatable raft called raft mania with a single paddle. The crew includes 8 participants and a qualified guide which guarantees the best safety conditions. We propose for you on The Verdon (river class 3 to 4) different types of courses. The following items will be at your disposal: raft, single paddle, lifejacket, helmet, neoprene wetsuit, neoprene jacket or windproof jacket and neoprene socks dependant on the season. THE RAFTING IS FEASIBLE ONLY ON THE DAYS WHEN THERE IS SUFFICIENT WATER, IN JULY AND AUGUST THIS IS GENERALLY TUESDAYS AND FRIDAYS. THE RATE OF THE WATER IN THE VERDON IS REGULATED BY THE EDF DAM (Chaudane/Castillon). THEREFORE THERE MAY BE CHANGES TO YOUR RESERVATION.